Last year, as I was roaming the Interboot Friedrichshafen boatshow at Lake Konstanz I found a nice little gadget that was appealing to me because it was so … obvious. 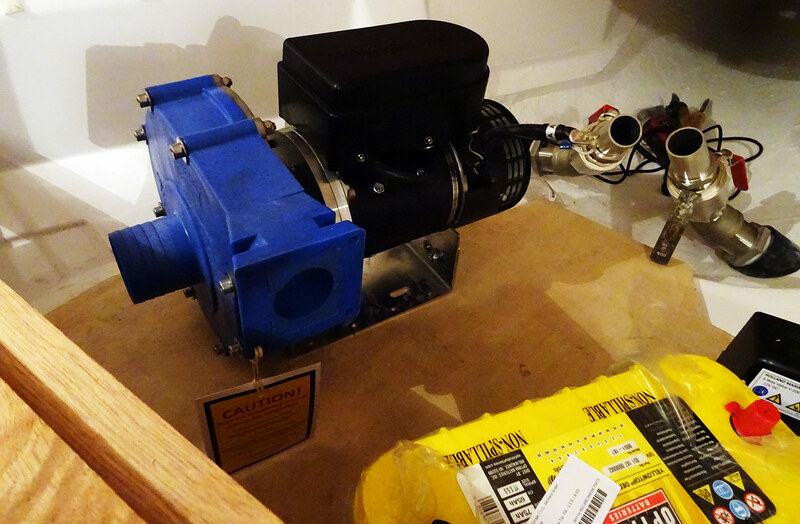 The Holland Marine Parts Jet Thruster is advertised as the clever alternative to ordinary bow thruster systems. And judging from afar standing under the bow of a Dufour Grandlarge 460 it seemed quite so. There are a couple of advantages which owners of boats equipped with the Jet Thruster system are talking about: Low maintenance, no moving parts, continuous running and flush assembly. As I´ve got the chance to witness the assembly of such a Jet Thruster System on a sailing yacht this week I took my chance to see what this is all about. What is a Jet Thruster? Jet Thruster is basically a large pump that will compress water and push it through a nozzle to either sides of the boat to create a gentle thrust. This thrust will make the bow move thus turning the boat into the desired direction. So I begin my tour of the Jet Thruster assembly yard at the bottom of the hull. In order to do so, there´s a lot of water rushing through the system. When I saw the thick tubing piled up in the boat´s cockpit it reminded me of the hundreds of liters of salty water which are moved savely inside the boat and pushed outside again. Assembly is tricky, of course and should be done by a specialized boat builder. I don´t think I would do it in my own back yard. First of all, three cut outs through the hull must be made: Water intake and the two outlets to either side of the bow. It has to be done exactly because the diameters of especially the intake is huge: In case of faulty craftsmanship here the amount of water coming into the boat would be severe. Main valve. Notice the size! The intake is first lead to the main valve. 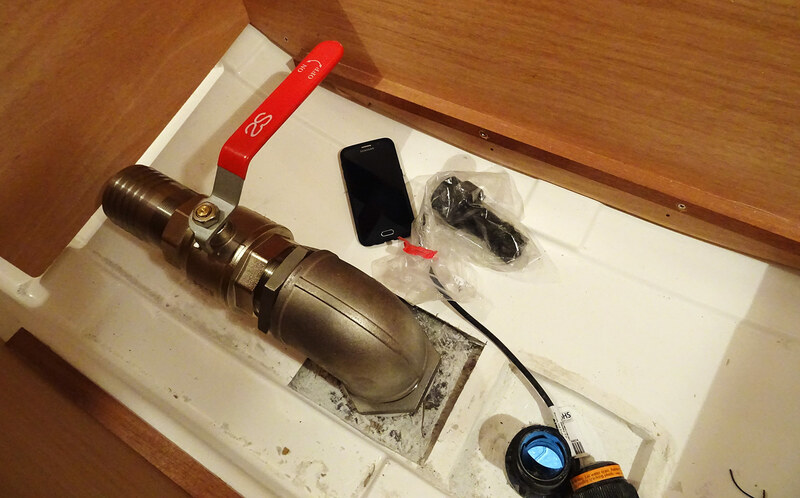 Notice the smartphone as comparison: That´s a huge valve for sure! From the main valve the tube will run to the pump. That´s the main unit of the whole system as the power and the thrust will be generated right here: By compressing the water and pushing it through a smaller diameter tubing further down the system. Two large batteries will have to be installed here as well as the system needs a fair amount of electric power too. The pump is the heart of the system. 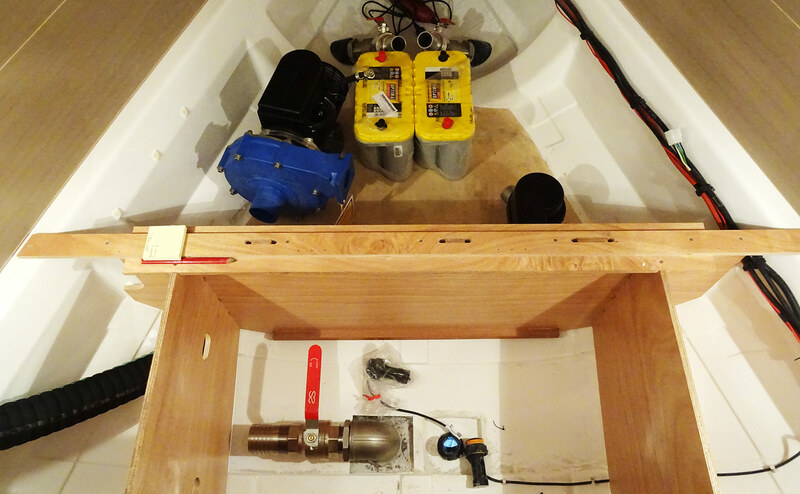 There are 12 Volt and 24 Volt options and another “mini” system available to fit every size of a yacht. 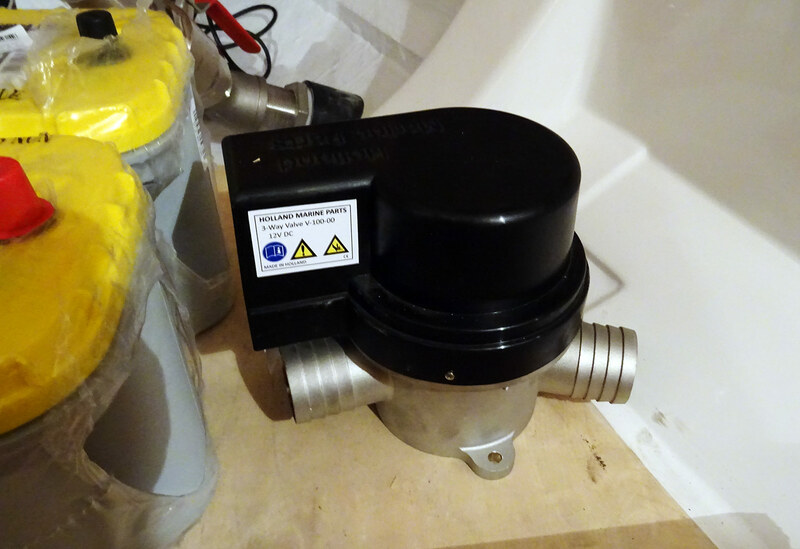 Do you need a bow thruster system? If you ask me, any yacht up until 42 to 45 foot can be moored and maneuvered safely without any technical assistance by a skilled sailor (read my 4 essential berthing tips here), but such a system will ease the effort enormously and take away stress momentum from both skipper and crews, especially in harsh or windy conditions. 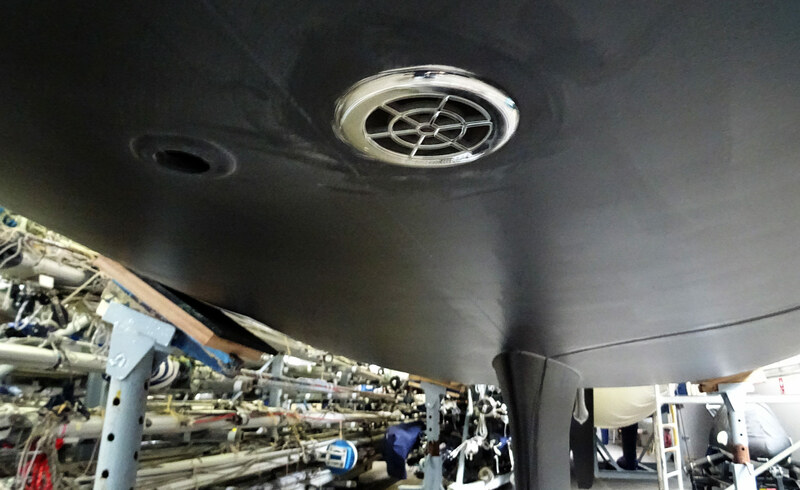 What is the main difference to ordinary Bow Thruster Systems? The Jet Thruster system has some very interesting characteristics worth mentioning. First of all: It´s a simple thing to move water. Continuously. 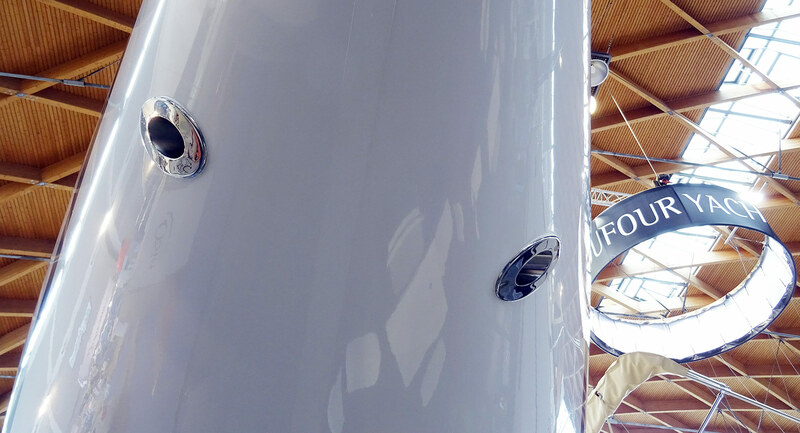 The diameters of hull cut outs are extremely small – even so one should mention that there are two of them needed. Some ordinary systems have electric of hydraulic moving extendible thuster units – prone to jamming and high maintenance or repair-costs. No such thing with a Jet Thruster. A jump back on board: The water will leave the pump and lead to a distributor unit which basically is a three-way-valve with a switch. Depending to which side the joystick on the controlling unit will be drawn, the very valve will be opened, the other will be closed. What´s the cost of a Jet Thruster-System? 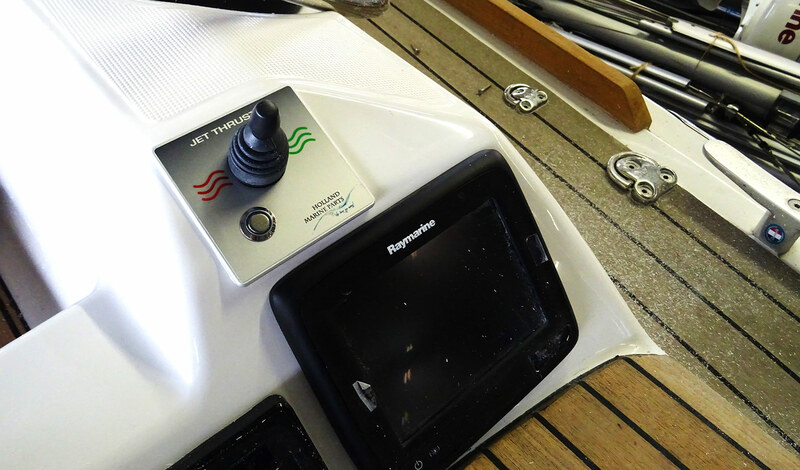 All in all I think that this system is a very interesting technical gadget that indeed is a very tempting alternative to ordinary bow thruster systems on the market. On larger yachts I already saw bow/stern-thruster configurations on this manufacturer and – no joke and no advertising – I know of four Jet Thruster-owners who are perfectly satisfied and happy with that system without exception. Do you really need such a thing? That depends on yourself. 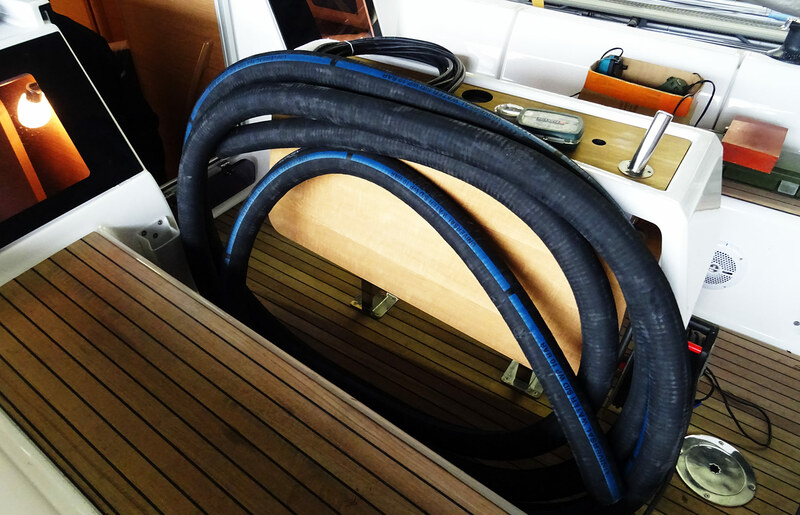 I wouldn´t go for it because I love “no frills sailing” and bow thrusters – no matter which system you decide to go for – are definitely a lot of frills: Wiring, fuses, tubing, valves, batteries … Ah, and what´s the price tag? 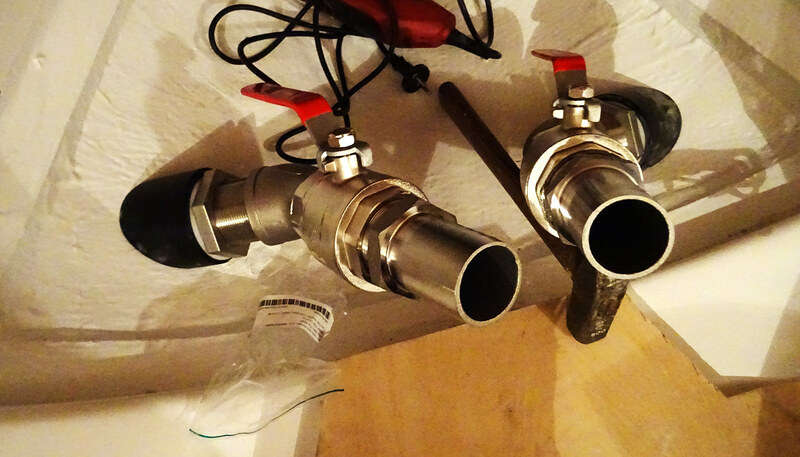 Bare Jet Thruster systems start at some 2.900 to 4.600 Euros. But you will need some more cash to pay for the assembly which is estimated to take around 20 net working hours. I hope to post a follow up article later this year on the Jet Thruster in live action. Sorry but you can not compress water! the system pressurizes and uses a venturi to increase velocity, not compress that’s an impossibility. You are quite right. Thanks for correction. This is a fantastic system. I’m so glad someone brought this product to the States now. JetThrusterUSA is GREAT!